Posted on March 30, 2015 March 30, 2015 by Brian C.
Contact: Michael Johnson, RoboLancers Coach, RoboLancers@gmail.com, 267-666-0246. 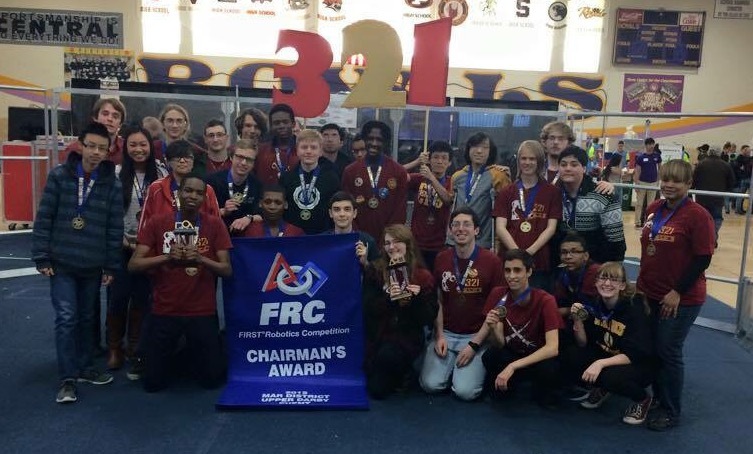 UPPER DARBY, PA, MARCH 29, 2015 — The Central High School RoboLancers won the FIRST Robotics Competition (FRC) District Chairman’s Award at a competition at Upper Darby High School over the weekend, the most prestigious award given at that competition. The award identifies the RoboLancers as a “model team” that has worked over the last five years to grow the robotics program within Central High School from 10 student members to over 100 while also inspiring thousands of students of all ages throughout the region to explore STEM fields. In a school district hard hit by budget cuts that have resulted in sharp reductions in science and engineering classes and programs in recent years, the RoboLancers have worked continuously to foster engineering and science education by mentoring younger teams in the city and hosting events for all levels of the FIRST program, from elementary to high school. They also host the annual Philly Robotics Expo (coming up on April 20 at the Singh Nanotechnology Center at the University of Pennsylvania), where hundreds of schoolchildren take robotics classes taught by the RoboLancers students and have the opportunity to meet and interact with other robotics teams and companies who come to exhibit their robots. The RoboLancers FRC team will compete at one more district-level event on April 3–4 at North Brunswick High School in North Brunswick, NJ, before joining other qualified teams at the Mid-Atlantic Robotics Regional Championship on April 9–11 at Lehigh University in Bethlehem, PA. In addition to presenting before a panel of judges in hopes of winning the Chairman’s Award for the whole mid-Atlantic region, the RoboLancers will continue to compete in the robot competition itself. The RoboLancers, like all FRC teams, had just six weeks, starting in January, to design and build their robots to play this year’s game, “Recycle Rush.” Objectives of the game include stacking large plastic totes, placing recycle bins on top of those stacks, and placing pool noodle “litter” in the recycle bins. During the first 15 seconds of each round, robots operate autonomously, following commands that the students have pre-programmed. Then for the remainder of the match, students operate the robots in real time via remote control. All FIRST tournaments are free and open to the public. 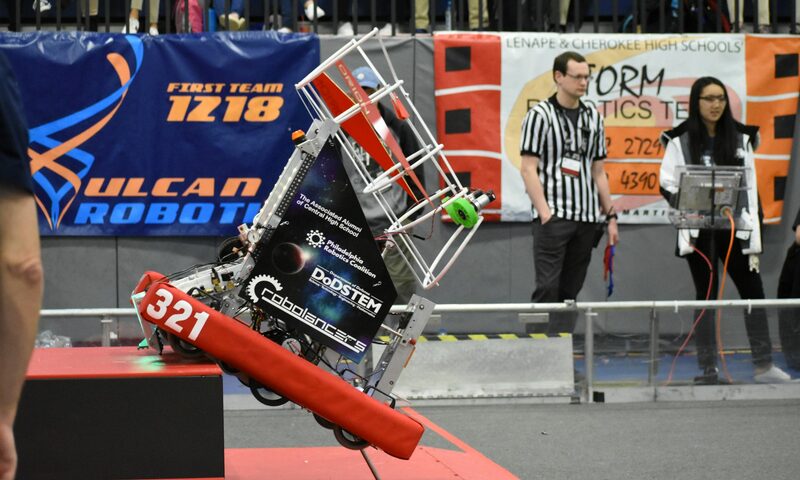 For more information on the FRC district tournaments and regional championship, see http://www.midatlanticrobotics.com/event-schedules/. 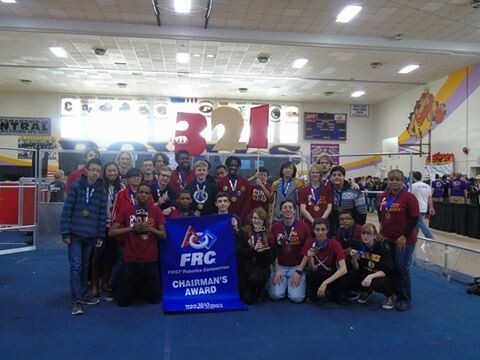 The Central High School RoboLancers is a FIRST Robotics Team founded in 1999. Starting with a small classroom of students, the team has now has grown to over 100 members. 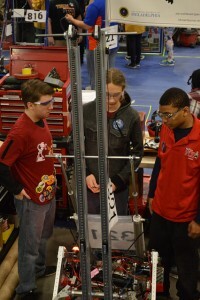 In addition to competing in multiple levels of competitive robotics events, the RoboLancers have helped mentor many teams across the Philadelphia region, including at Girls High School, Independence Charter School, G.W. Carver High School for Engineering and Science, and Martin Luther King High School, to raise awareness for the need of STEM education and occupations within Philadelphia and around the world. The RoboLancers have won many previous awards such as the Engineering Inspiration Award and traveled to the 2013 FIRST World Championship in St. Louis. The RoboLancers are growing, not only in their team but in their impact in the community; this Chairman’s Award is proof. Special thanks to our wonderful sponsors: The Associated Alumni of Central High School, The Central High School Home and School Association, McKean Defense, Comcast, PTC, P’unk Avenue/Ignite Philly, Bresslergroup, and Johnsonville.